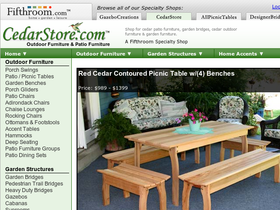 If you are shopping for outdoor and patio furniture, look no further than Cedar Store, online at CedarStore.com. This store offers a large selection of products in the categories of outdoor furniture, garden structures, home accents, and outdoor décor. Some of their most popular products include deep seating, garden bridges, patio and picnic tables, pergolas, cedar chests, custom pool houses, porch gliders, gazebos, and the list goes on. As the leading supplier of outdoor furniture and gazebos in Pittsburgh and Western Pennsylvania, you won’t be disappointed by Cedar Store’s selection. For all the best Cedar Store coupons, Cedar Store discounts, and Cedar Store codes, check out RetailSteal.com. Cedar Store ships via FedEx, UPS, and Motor Freight companies, and shipping is free on nearly all patio furniture. Rates otherwise vary. Cedar Store does ship internationally, but rates differ from United States destination rates. See websites for details and rates. Don't miss out on your chance to save 15% on all furniture at Cedar Store. Simply enter this promotional code at checkout to enjoy these savings. Use this coupon code exclusively at Cedar Store and receive a 15% discount on outdoor lighting. Use this exclusive coupon code at Cedar Store and save 15% on handcrafted mail boxes. Save 15% on rocking chairs from Cedar Store. Simply enter this coupon code at checkout to enjoy this discount. Use our exclusive promotional code at Cedar Store and save 10% on all bird houses and bird feeders. Hurry over to Cedar Store and enter our exclusive coupon code at checkout to save $50 on dining set purchases of $800 or more. Use the coupon code and get $20 off your $200 order at Cedar Store. Click link to shop online.